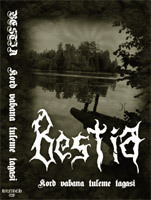 Description: pagan black metal from Estonia, cover is printed on glossy paper. Includes selected tracks from Bestia's debut album + bunch of bonus tracks and two rehearsal tracks. It should not be treated as "best of" compilation! At first this tape was going to be released on No Christ Records for South America in 2008, it never happened. Now finally 50 copies are released by Hexenreich Records!